You're $550 gas savings: Spend, donate, save or invest it? You're saving $550 on gas. Save or spend it? Rick Marxsen knows exactly how much gas cost the last time he filled up the tank of his Toyota Tacoma. He paid $2.29 a gallon in Denver, Colorado. Gas is even cheaper in his eastern Nebraska hometown, but he had to go with what was available when he was traveling for work as a member of a Union Pacific (UNP) railroad construction gang. 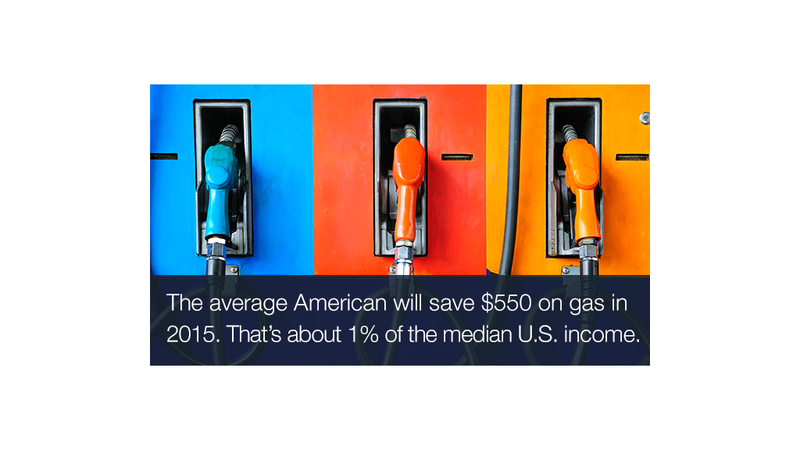 The U.S. government estimates Americans will save $550 on gas in 2015, and many have already saved hundreds this year. For people like Marxsen who are on the road constantly, it's an even bigger benefit. Marxsen and his colleagues often travel up to 700 miles to do repairs on the railroad lines. They trade tips on how to survive lonely stretches of Wyoming highway and, since they receive per diem travel rates, they trade tips on where to find the cheapest gas. "I never thought I'd see gas less than $3 again," he says. "You're going from spending $50 to spending $30 [a tank]," he says. Back when gas was over $3.50 in the summer, Marxsen would barely break even on some trips. Now that gas is so low, his per diem is almost like a bonus. The savings are clear. The question now for Marxsen and millions of other Americans is what to do with the money: spend, save, invest or donate it. 1. Spend: Walmart (WMT) is among the many stores predicting a boost in sales because customers will spend some of the money they saved on gas in its stores. Economists predict that every cent lower gas prices go adds about $1 billion to the U.S. economy, large because most people spend the "savings" elsewhere. Because the price of gas is so visible in America -- it's posted in big numbers at every gas station -- there's a real psychological effect. Mike Chadwick, CEO of Chadwick Financial Advisors in Connecticut, is hearing from some of his clients: "Christmas is easier for me now because I have some relief from lower energy bills." Related: Is the oil price scare over for the stock market? 2. Save: But rather than splurge on gifts, Chadwick advises clients to get back to the basics: "If they're not on track financially, I encourage them to save the money. Take whatever money you're saving and throw it at the debt you have." Katherine Dean, managing director wealth planning at Wells Fargo has similar advice: "If you aren't sure [what to do], then a good rule of thumb to follow -- save it." She notes that everyone should have at least a few months of savings for emergency purposes -- the typical is about three to six months' worth. One reader told CNNMoney that while his family hopes to save the money, it will almost certainly go straight toward paying higher health-care costs. 3. 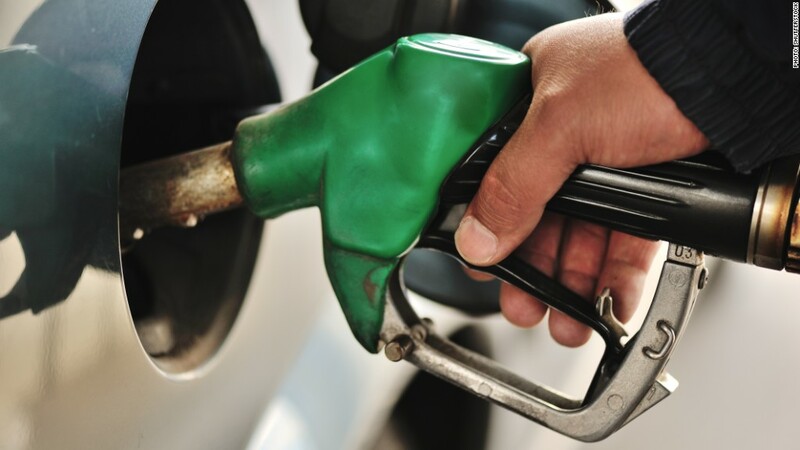 Invest: Many Americans are skeptical that these low prices will last at the pump, but they can make the savings last by investing it now and reaping even bigger benefits down the road. While $550 may not sound like a huge amount, the reality is it's about 1% of the U.S. median income. That could make a huge difference in someone's retirement account. A person could go from having a 9% contribution to a 10% contribution in 2015. That adds up. "A great use of the money is to put it in a 401(k)," Chadwick says. "They are not only saving the money, but they're getting a tax deduction to boot." That's exactly what 49-year-old Marxsen decided to do with the money he is saving on his travels for work. "The extra money is nice. I just throw it into my 401(k) for now. I can always back it off," he notes. 4. Donate: Those feeling extra charitable this holiday should also considering donating. Much like a 401(k) contribution, there are tax benefits to doing this. Most donations to non-profits are tax deductible. "You take it off your taxable income," explains John Sweeney, an executive vice president at Fidelity. "You pay no taxes on that additional reduction of income." Saving on gas this year and next isn't about skimping -- it's about living life the same way and still having the pleasant task of deciding what to do with an extra $550.